Jenny Collins, PhD Independent scholar This entry posted March 22, 2018 . The character of the Catholic education system in New Zealand was formed by direct Irish immigration and by French, English and Australian influences – the last partly a result of the large numbers of Irish who arrived in the country via Australia. However from the 1880s, the association between Irishness and Catholicism had strengthened as a result of the arrival of large numbers of Irish clergy, and teaching religious. For New Zealanders of Irish descent, Christianity in the form of the Catholic faith was fundamental to Irish identity. The Irish clergy and teaching orders that came to serve in the New Zealand Catholic schools brought with them a range of ‘pious practices’ designed to transmit the Catholic faith and to maintain Irish cultural values. It was a spirituality that emphasised prayer and pious practices, as distinct from the contemporary Protestant stress on salvation by faith alone. Perceptions of Catholics as poor, uneducated and working-class influenced the kind of spirituality promoted in New Zealand. Devotional practices learned in school were part of a spirituality that aimed to promote a basic level of religious awareness among Catholics and to protect them from the secular values of the outside world. The establishment of the Catholic school system in New Zealand was facilitated by the international growth of active congregations of teaching religious. (See Glossary below.) A significant increase in the number of female vocations (see Glossary) in the period 1840 to 1920 and the development of women’s religious communities meant that female congregations essentially dominated this new apostolate (see Glossary). Teaching congregations such as the Sisters of Mercy and the Marist Brothers of the schools adopted a modified monastic rule (see Glossary) that enabled them to meet the requirements of a rapidly growing system of education in countries such as New Zealand and Australia. They incorporated the advantages of mobility and adaptability with the mission to teach. The first teaching orders arrived in New Zealand in the 1850s. After the withdrawal of government assistance to Catholic schools in the 1877 Education Act, bishops persuaded various religious orders from European Catholic countries to establish and staff schools in New Zealand. The first major growth in religious orders took place in the 1880s with the arrival of Irish religious orders and some French orders, motivated by a new international missionary movement within the Church, a desire to escape religious persecution in their home country and a surplus of personnel. Religious orders that originated in Ireland were to be a vital factor in the Church’s implementation of a separate system of Catholic schools. All readily identified with the mix of Irish spirituality and nationalism that characterised New Zealand Catholicism after the arrival of the Irish bishops. They adapted with relative ease to a system of diocesan control based on trustworthy local priests and teaching congregations that obeyed the bishops with little question. Under the influence of Archbishop Paul Cullen, an Irish prelate on whom the Vatican relied to develop educational policy in the New World colonies, the Irish bishops in New Zealand worked to ensure that the right sort of new congregations were put in place. Practically every one of them was an Irish foundation, either directly from Ireland such as the Dominican Sisters, or by way of countries such as Australia, like some of the Mercy foundations. New Zealand bishops found that they were able to exercise control especially over the diocesan-based (see Glossary) women’s orders. Although the French orders that came to New Zealand in the nineteenth century never had the same numbers or profile within New Zealand Catholic education as the Irish orders, they brought the influence of their international traditions and the distinctive elements of their pedagogy. Of these the Marist Fathers and the Marist Brothers were influential in the education of boys and the Religious of the Sacred Heart and the Sisters of Our Lady of the Missions for girls. The religious orders that established educational foundations in New Zealand operated within a diocesan and a parish (see Glossary) context. By the 1890s there were four dioceses in New Zealand: Auckland, Wellington, Christchurch and Dunedin. A diocese was divided into a number of parishes, each run by a diocesan priest whose main task was to preach, catechise and administer the sacraments. (See Glossary.) The parish priest had a duty to establish a local parish primary school and through the bishop, arrange for a religious order to come and staff the school. The religious orders ran two kinds of school, the parish school and the order-owned school. Church protocol ensured that no religious order made an initial foundation of a parochial school or an order-owned school within a diocese without the permission of the local bishop although, once established, orders such as the Dominicans went on to set up their own order-owned schools. The way the Catholic primary education system developed in New Zealand was influenced by the requirements of the different religious orders. In order to survive, religious orders needed to maintain a distinctive value system, to establish clear boundaries with the outside world, to recruit and socialise new members, to satisfy role and status aspirations of their members and to maintain financial and material security. In addition each order maintained its own distinctive educational mission. ensure a reasonable enrolment of pupils. provided a satisfactory Christian education. ensure that these understandings were honoured. The relationship between religious orders and the diocesan bishop was influenced by an order’s status as pontifical or diocesan-based. The pontifical orders (see Glossary) operated under the governing authority of their own superiors, theoretically with minimal reference to the local bishop. For an order like the Religious of the Sacred Heart this meant the lines of authority went from a superior-general at the international level, to a provincial superior at the provincial level and a local superior at the convent level. All of the male orders involved in education in New Zealand operated under this pontifical model, as did some of the female orders, notably the Sisters of St Joseph of the Sacred Heart, the Religious of the Sacred Heart and the Dominican Sisters. The interests of pontifical religious orders did not necessarily correspond with those of individual diocesan bishops as is evidenced by the presence of Marist establishments across diocesan and national boundaries and the number of disagreements over issues such as the provision of school buildings and resources. It is hardly surprising to find that bishops generally preferred diocesan-based orders such as the Sisters of Mercy. Under this model, a female order established its ‘motherhouse’ in a diocese (see Glossary) and later might establish other ‘branch’ houses. The usual justification for diocesan-based orders was their flexibility in response to local demands. The bishops favoured diocesan orders as they had more control and could plan with some certainty for educational developments within the diocese. However, in an education system lacking strong national coordination of policy and resources, the presence of orders limited to one diocese also prevented the efficient deployment of surplus teachers and resources in one area to another diocese where they might be better utilised. Members of diocesan orders were not as exposed to new ideas and educational developments as were members of pontifical orders and they did not have the same mobility, thus they were subject to the dangers of narrowness and isolation. The jurisdiction of the superior of a diocesan congregation was limited to the group under the authority of a ‘mother house’. The superior, in turn, came under the direct authority of the bishop of the diocese. This situation frequently led to a proliferation of different groups within individual diocesan orders and by the early twentieth century, for reasons of efficiency, a number of them amalgamated. By 1950 the Sisters of Mercy and the Sisters of St Joseph of Nazareth were the only two diocesan teaching orders in New Zealand. 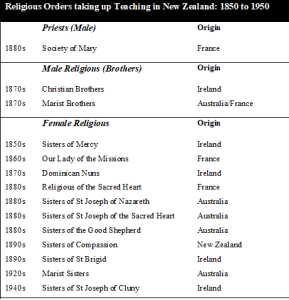 Yet the Mercy Sisters with 715 members were the only order present in all four dioceses; they constituted by far the largest teaching order in New Zealand and controlled the majority of the schools. The struggles of the Sisters of St Joseph to maintain autonomy in the face of episcopal insistence on diocesan control illuminates the complexities of the Catholic education system and the difficulties faced by an Australian-based order, which also established foundations in New Zealand in the 1880s. It also exemplifies the conflict between local bishops who wished the orders under their authority to cater for a wide range of educational aspirations within their diocese as opposed to the explicit ‘mission’ of the Josephite Sisters to provide an elementary education for working-class Catholic pupils rather than an education in the ‘accomplishments’ that would enhance the upward social mobility of their female pupils. Founder Mary MacKillop’s uncompromising stand in defense of her desire to retain central control of the Josephite sisters and her promotion of an egalitarian spirit among her sisters brought her into direct conflict with a number of Australian bishops. It culminated in her excommunication by Dr Lawrence Sheil, Bishop of Adelaide and the expulsion of forty-seven sisters from the institute. Bishops James Quinn of Queensland and Matthew Quinn in Bathurst also waged a bitter conflict with Mary MacKillop over the right of the Josephites to their own autonomy. Papal acceptance of the pontifical status of the order further alienated these bishops who were determined to make the Josephites subject to diocesan authority. As a consequence Mary withdrew her Sisters from Queensland and Matthew Quinn presented the Sisters in Bathurst with an ultimatum – they could stay and accept diocesan control or leave the district. One Sister, Hyacinth Quinlan, remained to train the recruits the bishop had imported from Ireland but the others left. This conflict caused ongoing difficulties for the Josephite order in its New Zealand foundations. In 1880 Sister Hyacinth Quinlan and four other Bathurst sisters were invited by then Bishop Francis Redwood of the Wellington diocese to establish a diocesan school in Wanganui – these Sisters became known as the ‘Black Jos’ or more formally the Sisters of St Joseph of Nazareth. In 1883 the ‘pontifical’ Sisters of Saint Joseph from Adelaide– later known as the ‘Brown Jos’ or Sisters of St Joseph of the Sacred Heart were invited by the same Francis Redwood to make a foundation in Temuka South Canterbury – also part of the Wellington diocese at the time. The move caused resentments and difficulties for the earlier foundation, which spilled over into their relations in New Zealand. 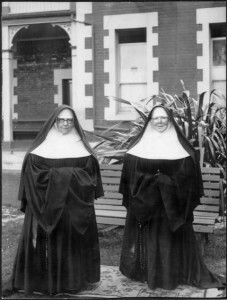 The Wanganui Sisters, who had not been consulted regarding the introduction of the pontifical Josephites, were instructed by Redwood to adopt a black habit to distinguish them from the other Josephite sisters who wore a brown habit. The Sisters became victims of power struggles among clerics, who were attempting to control the way the women religious exercised their educational mission. Complex relations between diocesan and pontifical orders and the Episcopal authorities in each diocese shaped the nature of Catholic schooling. Diocesan-based orders such as the Mercy Sisters provided the ‘shock troops’ that established the parish-based elementary education system in all four dioceses. Subject to the authority of the bishop they were able to provide a quick response to diocesan-based educational needs but suffered from from insularity and inflexibility in regard to national educational needs. The pontifical orders retained a greater independence and a closer contact with international educational developments, but their educational interests frequently crossed diocesan boundaries. They in their turn were constrained by the requirements of their own internationally based authorities. The teaching religious orders that came to New Zealand in the latter part of the nineteenth century were the foundation on which the Catholic education was built. The majority of the ‘new’ nineteenth-century religious orders worked to provide a basic primary school education for the Catholic population. Some of the female religious orders offered a ‘culture and accomplishments’ curriculum; from the 1880s male orders such as the Society of Mary (Marist Fathers) offered a classical curriculum (including Latin and often ancient Greek) to small numbers of boys. The parochial schools catered for the poorer children while the more affluent attended order-run schools where they paid higher fees. Fundamental to the success of the Catholic school system were the thousands of women religious who staffed and ran the vast majority of New Zealand Catholic primary schools. The male orders, brothers and priests constituted at best only one seventh of the teacher numbers. In general they taught boys from the senior primary level onwards. Particular religious orders, such as the Jesuits, the Society of Mary, and the Sisters of the Sacred Heart and the Dominican Sisters catered for the upper echelons of Catholic society, while the Christian Brothers, the Marist Brothers, the Mercy Sisters and the Sisters of St Joseph were established to cater to those at the lower end of the social ladder. In nineteenth century New Zealand the situation was complicated by the relative scarcity of schools catering for the secondary education of Catholic boys. St Patrick’s College, established in 1884 by the Society of Mary, was the first Catholic secondary school for boys in the colony. 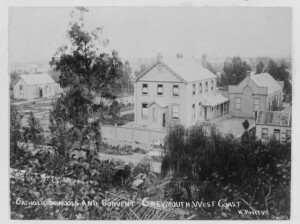 The first Christian Brothers’ school in Dunedin, established as a primary school in 1876, later added secondary classes to become Christian Brothers High School. The Marist Brothers established Sacred Heart College Auckland as a secondary school in 1903. In addition a number of women’s religious orders catered for the different social groups by establishing separate schools. 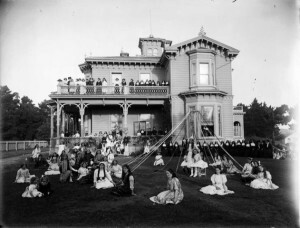 In the case of the Dominican Sisters they established two schools on the site of their motherhouse in Dunedin in 1871, one which was fee paying for those who could afford to pay and another which did not charge fees. Some orders catered to a wide range of clientele. For example the Sisters of Our Lady of the Missions established secondary schools in Christchurch, Napier, Nelson and New Plymouth, an Industrial school for girls in Nelson and St Joseph’s College for Maori girls in the Hawke’s Bay as well as numerous primary schools. Many of the on-line links provided in this entry are to the New Advent Catholic Encyclopaedia. While the entries are accurate enough, it must be noted that they are not written from a critical perspective, and therefore have their limits. Apostolate: In Catholic contexts, the position or authority of an apostle, a form of evangelistic work such as teaching or nursing. Catechise: To give oral instruction in the principles of the Christian religion often by means of question and answer, typically by using a catechism, that is a summary or exposition of doctrine. Congregation: A group of religious brothers or sisters obeying a common religious rule. Diocese: A district composed of parishes under the pastoral care of a bishop. Excommunication: The action of officially excluding someone from participation in the sacraments (see below) and services of the Church. Monastic rule: Religious communities in the West are usually organised into orders and congregations guided by a particular religious rule, the most common being the Rule of St Augustine or the Rule of St Benedict. Motherhouse: The founding house of a religious order. Parish: A parish is a district within a diocese under the pastoral care and clerical jurisdiction of a parish priest, who operates from a parish church. Pontifical order: The religious order, or sacred congregation is responsible and accountable to the Pope. It is not under the direct authority of a diocesan bishop. Prelate: A bishop or other high Church dignitary. Sacraments: In the Catholic Church, the sacraments are seven in number: baptism, confirmation, the Eucharist , penance, anointing of the sick, ordination and matrimony. Vocation: the divine call to the religious life, often leading to entry into the priesthood or a religious order. Akenson, Donald Harman. 1990. Half the world from home: Perspectives on the Irish in New Zealand. Wellington,: Victoria University Press. Collins, Jenny. 2006. For the common good? The Catholic educational mission, 1945-1965. PhD Dissertation, Education, Massey, Palmerston North. Curtis, Sarah Ann. 1994. Educating the faithful: Catholic primary schooling and the teaching congregations in the diocese of Lyon, 1830-1905. PhD Dissertation, Indiana University, Indiana. Doyle, Alban. 1972. The story of the Marist Brothers in Australia, 1872-1972. Drummoyne, Sydney: The Marist Brothers of the Schools. Fogarty, Ronald. 1959. Catholic education in Australia, 1806-1950. Vol. 2, Catholic education under the religious orders. London: Melbourne University Press. Hellinckx, Bart, Frank Simon, and Marc Depaepe. 2009. The forgotten contribution of the teaching sisters: A historiographical essay on the educational work of Catholic women religious in the 19th and 20th centuries. Leuven: Leuven University Press. King, Michael. 1997. God’s farthest outpost: A history of Catholics in New Zealand. Auckland: Penguin Books. O’Donoghue, Tom. 2001. Upholding the faith: The process of education in Catholic schools in Australia, 1922-65. New York: Peter Lang. Rogers, Anna. 1996. A lucky landing: The story of the Irish in New Zealand. Auckland: Random House New Zealand Ltd.
Simmons, E. R. 1978. A brief history of the Catholic Church in New Zealand. Auckland: Catholic Publications Centre. Spenser, A. E. C. W. 1972. The organisation of Catholic schooling in New Zealand: Interim report. Unpublished personal copy. Stevens, Diane. 2001. In step with time: A history of the Sisters of St Joseph of Nazareth, Wanganui, New Zealand. Auckland: David Ling.